Wellesley Town Hall is located at 525 Washington Street, Wellesley, MA 02482; phone: 781‑431‑1019. Photo: Wellesley Town Hall, ca. 1883, 525 Washington Street, Wellesley, MA. Listed on the National Register of Historic Places in 1976. Photographed by Jack E. Boucher, 1988, Historic American Buildings Survey [HABS MA-1230], memory.loc.gov, accessed December, 2013. Originally part of the Town of Dedham, Wellesley was settled in the 1630s. In 1881 residents of the town (which was by then called West Needham) seceded from Needham, chartered by the State Legislature. Wellesley is chiefly known as the seat of Wellesley College. Its proximity to Boston, however, its convenient rural atmosphere, pleasant homes, the beauty of the college campus, the delightful drives, and hills which offer charming vistas at every turn, combine to make Wellesley a most attractive residential town. Though it is by no means a manufacturing center, several small industrial establishments are situated here. As long ago as 1794 a sawmill was set up. Later on paper mills, hosiery mills, in 1880 a shoddy mill, a shoe factory, a paint factory, and a chemical factory developed. At present  the industries of the town are the making of electrical machinery, hosiery, and shoddy. For the most part, however, Wellesley comprises farms and residences. The name Wellesley is an adaptation of the family name of Samuel Welles, a Harvard graduate and son of a graduate of Yale, who in 1763 established his home here, within the limits of the town of Natick. 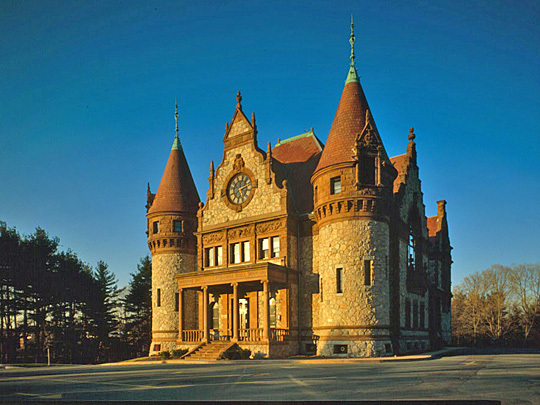 In 1881, Samuel Welles' grandson-in-law, H. Hollis Hunnewell, bought the vast Welles estate from the several heirs who then owned it, and gave to it the name of Wellesley. The first white settler to establish himself in this region was Andrew Dewing, who erected a garrison house in 1660. In the spring of 1881 a petition was granted whereby the settlement became a separate town. That it was poor compared to other communities is clear from the absence of fine old houses of the Colonial period The farmers, who comprised nearly the whole population, did not cultivate large tracts of land, but depended chiefly on the sale of wood, bark, hoop-poles, and fagots to supply them with the necessities they could not raise. About the middle of the 19th century, however, the town took a new lease of life. In 1883 sidewalks were laid, a watering cart was put into service, and a fire department was organized. A board of health was established in 1889. About this same time the town was given its present trend by the foundation in 1871 of a Female Seminary, later to be Wellesley College. Henry Fowle Durant, the founder, was a resident of Hanover, New Hampshire, and a graduate of Harvard. His purpose in creating the seminary was not only to offer young women opportunities for education equivalent to those provided for men, but also 'to establish an institution for the greater glory of God.' On August 18, 1871, the cornerstone of the first building was laid by Mr. Durant. On September 8,1875, the school, now officially Wellesley College, opened its doors to 314 students. 200 were turned away for lack of room. The main building contained the first laboratories for scientific investigation made available to women in the United States.